EM Acoustics selected ISE 2017 as the launch forum for their brand new ESP Series of compact, self-powered, multi-purpose loudspeakers for a variety of live applications. 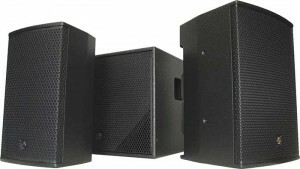 The range currently comprises three models: the ESP-8 and ESP-12 loudspeakers, both with coaxial designs for true point-source performance and the ESP-15S compact reflex subwoofer. The ESP-8 is an 8-inch, 2-way coaxial loudspeaker whose powerful performance belies its diminutive size. The coaxial drive unit arrangement provides a uniform 100-degree conical dispersion pattern with very smooth off-axis response and none of the parallax effects that would be generated with separate HF and LF drive units. The result is a compact, fully self-contained loudspeaker system that delivers excellent performance across a range of applications from small FoH duties to speech reinforcement, front fill or compact stage monitoring. The ESP-12 is the bigger brother of the ESP-8, sporting the same coaxial design in a compact, lightweight, multi-angle enclosure. Both enclosures benefit from the latest on-board class D amplification technology and sophisticated DSP processing for high performance as well as reliable limiting. The amplifier power supply is a universal voltage design meaning that ESP-8 and ESP-12 will operate happily across the globe. Four built-in presets are available for different applications: stand-alone use, flat response, use with a subwoofer and stage monitoring. A number of intuitive rigging options are available for swift and easy set-up. Last but not least is the ESP-15S compact reflex subwoofer that extends the low frequency performance of the ESP Series down to 45Hz. ESP-15S delivers a very high power-to-size ratio, as do ESP-8 and ESP-12. Integral handles, a polemount fixing and optional castors make the ESP-15 easy to deploy in a wide range of applications, whilst four presets, each with a different low pass filter frequency, enable the user to modify the characteristics of the subwoofer to suit his taste.